Deus Ex hit retail in 2000. Epic Mickey debuted in 2010. What was Warren Spector working on in the interim? Apparently, Half-Life. Kotaku has discovered an excerpt from a 2012 book titled Gamers at Work: Stories Behind the Games People Play that reveals an unexpected link between Deus Ex creator Warren Spector and Valve Software's phenomenally beloved shooter Half-Life. Like most independent studios trying to compete in the tripe-A space, much of the time was spent conceptualizing ideas and trying to find funding partners for them. We generated several original concepts -Â some of which we did find deals for and were able to take to prototype, and some of which just died. We worked with a couple of Hollywood directors on concepts, including [famed action director] John Woo. We had a development deal with one publisher to make "Ninja Gold," a game concept which we developed with John. We did some work for Valve on some Half-Life stuff. We developed and got a deal for a huge fantasy game called "Sleeping Giants." And we got a contract with Disney to do the Disney Epic Mickey game, which eventually led to the acquisition and to us walking away from all of those other projects and opportunities. 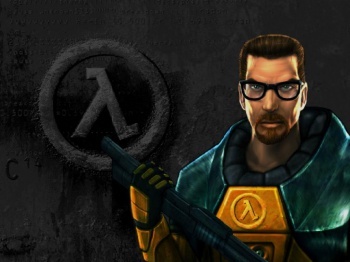 While Spector doesn't specify exactly what he means by "Half-Life stuff," we see a few distinct possibilities: First, there's the idea that Spector's team was hired by Valve to create some of the content found in Half-Life. That's exciting for all kinds of reasons, and lends more stock to the idea that Spector is a legendary game designer. On the other hand, since no time frame is specified for this work, and PC titles (particularly first-person shooters) of the late 90s were a ripe target for post-release additions (expansions, level packs -Â all the things that we now know as DLC), it's entirely possible that Spector's team worked on something akin to Gearbox Software's Half-Life: Blue Shift, an addition that expands the scope of Valve's original game with new plot points and content. Then again, it's also entirely possible that Spector had a hand in Half-Life 2. The development of that title more or less matches up with the time frame we're imagining here, and it would have undoubtedly been a much larger production than its predecessor, requiring more developers to create more content. It's perfectly reasonable to believe that Valve might've farmed some part of the game's creation out to Spector. Whatever the case, Spector's involvement with the Half-Life franchise only further solidifies his credentials as one of our top games makers. And, now that we know all of this, we're able to impress other people with such a geeky point of trivia. If you win any bar bets, we demand 10 percent.